Amidst reports, which had it that the US Department of Homeland Security had identified malicious cyber activity by the North Korean government, just days after the historic summit between President Donald Trump and North Korean leader Kim Jong Un, DISEC passed a resolution in regard to mechanisms to regulate digital arms. According to sources, the US is very much aware of North Korea's prowess in cyberspace and North Korean hackers are believed to have been behind or to have played a part in major cyber attacks including the WannaCry ransomware attack, which infected hundreds of thousands of computers just last year, as well as the hack of Sony Pictures Entertainment in 2014. Moreover, North Korea is not the only nation state that has been called out by the US for its malicious cyber activities in recent months. Hopefully, the cooperation and diligence of DISEC will pay off in checking digital arms and how these are misused by both state and non-state actors and also help reduce the threat of cyber wars. The committee is currently occupied with the second topic on its agenda: Regulation and Control of Autonomous Weapons in Conflicts. Faced with issues in regard to techno­­logical rev­­olu­tion in war­fare, delegates are concerned with the progres­­sing auto­­nomy in weapons systems such as drones and Artificial Intelligence bots and the impacts they may have. These weapons or bots which exhibit capabilities to operate without human gui­­dance, pertain to less contro­­versial functions such as navi­­gation and oversight. Furthermore, there is also the alarming prospect of robots making killing decisions, thus increasing the stakes in determining between hostile targets or non-hostile ones. 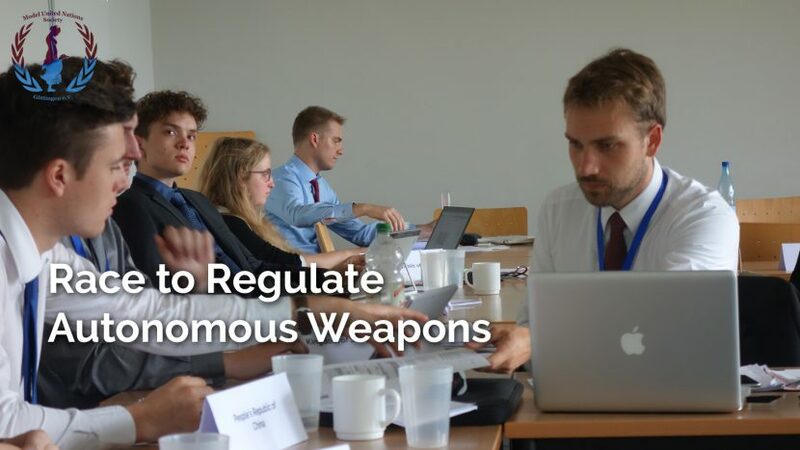 All of these have given rise to funda­mental ethical and legal concerns amongst delegates, who are diligently working to find possible ways in regulating these weapons. Consequently, delegates have already come up with four working papers, spearheaded by the delegates of Sweden, India, France and Israel respectively. Chairs of the committee seem hopeful and are pleased with the level of cooperation among delegates. It should not go unsaid that that DISEC’s work over these past few days have been really impressive!